Do you work for KeePass? KeePass, the free, open source, light-weight and easy-to-use password manager. Learning about KeePass? We can help. "Nice tool for storing passwords"
In general, i like all virtues of this tool, easy and simple but complete. For any tool for password storing, it's a complete tool, i like all of this tool. I recommend this tool for storing passwords, again, simple and easy to use. Helpful tool. I use to store all passwords about servers, applications, mails, users passwords and any element that contain some password. It's help me to keep control of all passwords that i use. "Master tool to store your keys"
KeePass is the right tool to keep my keys secure and encrypted. It is great all the capabilities offered by encryption with powerful algorithms such as SHA-256. I like it to be free and open software, available on Linux, Windows and Mac. The password generator is very useful for applications that require keys with specific parameters: use of special characters, capital letters, total amount, etc. Getting a specific password is quick and the bullets help a lot in this search. KeePass allows us to keep all passwords locally and not on a server, which greatly improves the security of the company. The user interface is complicated, they should improve this section to have a better experience when browsing this software. The multi-user mode is not the best, basically one of the users could change the passwords of others easily. They could evaluate a better way to sort passwords and new safe projects. Keep in mind that the unique location of your passwords has a potential risk and is the integrity of the KeePass guest team. This device must have the highest safety and a reliable source of electrical power. With KeePass we can have centralized passwords for fast access and efficient management. This improves the security of the company in this area as crucial as credentials to devices and applications. Thanks to KeePass, the management and management of the keys can be controlled on a computer that does not have access to the network. "KeePass - Password Management Made Simple"
Having all my passwords in one place with so many options for unlocking the database. I share my database with other employees at work. Making password access, changes and management so simple. Our vault files are stored encrypted in the cloud and use file synchronization to propagate the changes near instantly. The built in password generated is also a nice added bonus! The interface itself feels a little dated. Reminds me a bit of an old Windows 95/98 application. But functionally it works as intended. Would love to see a Chrome plugin so that my passwords could be easily accessed while working via a web browser. It's a great, secure and free option for password management. I can't express enough how powerful this becomes when paired with cloud storage / synchronization. We use BOX at work... but any of the other cloud storage providers should work well too. Password management is always a pain. But this replaced a spreadsheet which is immensely insecure in comparison. Pairing this with cloud storage means everyone is always up to date with changes. First advantage is that KeePass is free. KeePass uses strong and secure encryption algorithms such as AES, ChaCha20 and Twofish, and SHA-256 hashes. KeePass automatically generates low-intuitive passwords (for each service). With the ability to create groups in KeePass, sorting passwords will be easier. KeePass is an open source password manager so people made version for Linuks, OS X, Pocket PC and Android. In my opinion first disadvantages is that KeePass have not very intuitive interface. The design is not user-friendly for new users of this program. In my opinion KeePass should pay more for opinion in others web sites. If u want to use it in my opinion you should use Professionall Edition. That give us more option. I can now have passwords that are difficult to break everywhere and I don't have to remember about them thanks to Kepas. I am safe everywhere i am thanks to KeePass. "KeePass - All passwords in one place"
+ Automatic creation of password database backup. + Lightweight program with portable version. Problems with database synchronization and opaque design. Despite these small inconveniences, Keepass is a very flexible program that is easy to use and significantly increases security. It is worth spending a few minutes on downloading keepass, because a secure password can protect us from unauthorized access to data important to us. As a person interested in cyber security, I know how important it is to have strong passwords, thanks to keepass we can store our passwords on your computer without saving them in dangerous places. "KeePass, un programa sencillo pero de lo más útil"
En el mundo actual en que vivimos en el cual cada día nos registramos en un sitio o en otro y en cada sitio metemos una contraseña,cada día se hace más importante un programa de este tipo, un contenedor de contraseñas de manera organizada. Es un programa muy sencillo pero a la vez muy útil. Tengo que decir que el programa tiene muchas más cosas que no uso, me he ceñido a usar lo básico para mi día a día. He notado ciertas dificultades al pasar la base de datos de Windows a Android, al menos no parece que sea de manera fácil y automática. El autorellenado es complejo de utilizar. Os recomiendo usar este programa para el almacenaje de passwords ya que cada vez es más complicado acordarse de todas con tantas cosas. En mi trabajo uso constantemente este programa ya que mucho dispositivos a los que nos conectamos tienen una contraseña propia y no se accede con nuestro usuario de radius. Esto supone acordarme no solo de la password si no también del usuario por lo que es tarea complicada. Así que me he creado una base de datos con todo a lo que accedo, tu accedes a la base de datos con una única password y ahí puedes buscar justo la que necesitas. La base de datos la puedes portar a otro ordenador sin problemas. El programa dispone de muchísimas opciones más que iré investigando, pero de momento os recomiendo su uso. Keepass is a really good tool for password management. I use it both for personal and work related accounts management and its really straightforward. Password generator included in Keepass allows users to generate strong passwords really fast. The application shortkeys allow users to automatically enter the credentials to acess a site with the only effort of pressing two keys. You can export and import the application database into an encrypted file to transport and use it wherever you might need. The accounts grouping functionality is good to properly order the different accounts by project or theme. The look and feel of the desktop application is quite old fashioned, but usable. Keepass app for Android devices is quite complex to use and not too much intuitive. Keepass is a good tool for credentials management when you have a lot of user accounts scattered on many systems and web pages. When you have a lot o user accounts for different websites and application Keepass helps you to manage them easily and securely without too much effort. "Free and open source Password Manager | KeePass"
It is free, open source and lightweight software. It's nice to have KeePass to manage my passwords in a highly secure way in which nobody except me will be able to access my data. We have to remember only one master password through which we will be able to retreive all other passwords if it is correct. The UI is very old. It needs to be updated. Other than this, everything is fine. As the databases created by KeePass are encrypted using most secure encryption algorithms - AES and Twofish, we can trust it for using the company's credentials. It's so that we dont have to remember each of the internal passwords like FTP, SSH, Login password, web password, etc. As sometimes we used randomly used passwords, it becomes very hard to remember those complex passwords. "Protega todas sus claves con una base de datos profesional"
keePass es un software totalmente libre y disponible para todos los sistemas operativos disponibles en el mercado y dispositivos móviles, es un administrador de claves el mismo usa un motor de base de datos integrado para controlar todas las entradas que puede ir creando el usuario, puede tener protegidos desde personales como también de acceso a equipos, por cada entrada es posible la encriptacion de la información para protegerla aun mas. Puede personalizar las entradas que se van creando para poder adaptarla a las necesidades se puede agregar notas e incluso links para acceder a la pagina en relación. La base de datos puede ir creciendo segun las necesidades del usuario, al momento de ejecutar el programa es posible proteger toda la data usando una clave maestra. A nivel de espacio en disco es realmente ligero para todas las herramientas que posee. Altamente recomendable si quieres llevar todas las claves de manera profesional y segura. Puede resultar un poco complejo de configurar la primera vez que se ejecuta, se requiere paciencia y tiempo para realizarlo. El programa es un excelente administrador de claves, altamente recomendado para llevar todos es posible administrar todo lo que se requiera de forma segura y lo mejor de todo totalmente gratis. El programa lo usamos para administrar todas las claves de los servidores y servicios de la empresa, ya que el mismo nos ofrece toda la seguridad necesaria para evitar la perdida de la información. "The keys to your life in a single container"
As a key method of protecting passwords to retain information about access to the security world of secure credentials. Keepass is a fact to retain all the passwords that you want to store, be it personal or work levels. As a tool we have been able to document all access to devices that warrant a safe entry. Most of the time, they are integrated under generic passwords. So Keepass has become the need for everyone to manage multiple profiles and access to devices. Its interface is quite complete and striking. Thanks to its power to create structures through groups of folders, it is possible to have as an order all the passwords that belong to a unique distribution. Keepass is a totally safe container to retain all the passwords that you wish to store for your respective work, However, in order to obtain greater security and availability of the tool, I recommend that you make several backups of the file containing the passwords. Keepass has become an indispensable tool to obtain access to applications that need secure credentials every time. Therefore for the daily work of our department in sequence to the results of optimized work, we consider that they use this tool to have everything under control in this platform. "KeePass - Fast and safe"
KeePass is a program that allows me to store and generate passwords safely. The main advantage of this solution is that it is available completely free of charge. 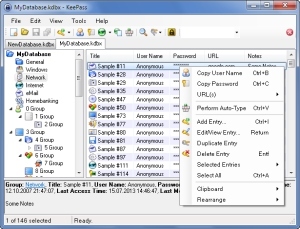 Keepass is a multiplatform solution running on such systems as Windows, Linux, and Mac. It also has support for mobile devices (Ios/Android). It is worth mentioning that the passwords we generate are stored in a secure encrypted file that can be moved between devices using a cloud/portable memory. The ability to integrate with any (modern) web browser is also a plus. One of the disadvantages of KeePass is the fact that if we forget the main password, we will not have access to our data. I also lack the possibility of direct integration with clouds. If you are looking for a password manager that is available for free and allows you to save as many passwords as you like, you should consider trying KeePass. By using KeePass I am able to generate and save random passwords, so that no one will gain access to important accounts. "Keepass, tu memoria portatil virtual"
The most useful tool to carry out your key memory to all sides, without losing the knowledge of any. Here you have the keepass to be able to speed up your different stages of your life. However, so that it does not run. Thanks to her, it has not been blocked or lost. What I like most about the tool is the frontal or graphical part where you can manage by schemes or structures all types of access as tree of system schematization. Help to have the day under control. As compared to other solutions like Lastpass and Dasline which are easy, Keepass is a bit complex. It might be difficult to navigate at first but once you get used to it it is a great software. Its also free. Its is very secure if you use best practices to secure your password database e.g using the inbuilt algorithms to generate passwords. Personally I feel better that I have taken the best available option to secure my passwords. Thats all you can ever do. "Your security keys at hand"
Too much security in the hands, the most complete security tool that stores all the keys of your life digitally. I really like the tool because you can have it as an executable at any time of life, wherever you want. It is portable and very unique. In fact the development and benefits are demante by the users. The only thing that I do not like about the tool is that if you store it in the cloud as an executable backup file, you must link that the tool does not hang, since it depends a lot on opening the amount of shared keys that exist. In the same way it is part of a general security key, because if you forget the access code to the program or file, you lost everything, since there is no way to recover it easily. I totally recommend the tool, for those people who need to have several access codes, handle all types of passwords and you can configure them by folder. 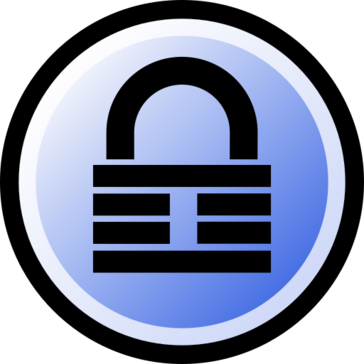 KeePass is a free password management solution that supports Windows and has unauthorised versions for Linux, Mac OS X, and mobile devices which are available on the official KeePass website. In contrast to the competition, the software is open-source and free of charge. KeePass provides several encryption standards, AES and Twofish, that ensure high-security level. The application could be customised to use cloud storage to sync data, but the databases are stored locally by default. You can keep your password database around, as developers offer a portable version of the software on a USB flash drive. KeePass is a fully customizable solution so that your passwords could be divided into categories to segregate data if you use different databases for specific actions. Importing the data from other sources such as web browsers, password managers, and generic password files is seamless. Using KeePass for the first time might not be transparent, as the program brings up a blank interface and it may take some time to get started with it so that I suggest looking for a tutorial to configure the tool correctly. If you are looking for a password solution that provides many features, you might consider trying Keepass. Moreover, the software is open-source and fully customizable, so it's likely that the tool will meet your needs. KeePass allows me to store my passwords in one, encrypted safety vault, so to get access to hundreds of my account I need to remember one password. Also, because of my frequent travels, the portables version is a comfortable solution. "Simple secure interface and it's free"
I like that there is a method of storing the database on my own pc/dropbox account rather than on someone's cloud service. I'd rather have the peace of mind knowing how I'm securing it rather than some other company. The software is easy to use, simple and of course free. I'm achieving greater security by having this application installed on my pc and phone by allowing it to come up with lengthy passwords instead of things I need to remember. Thus far, I can't say that I don't like anything about it. It does what it should and doesn't pretend to do other things it doesn't need too. If you are looking for something simple that just does what a password manager should, then this is the product for you. It's not pretending to be something that it isn't and by doing that, they are providing a product that simply works and has not had issues since the day I installed it. It's nice with the categorizations it allows you to setup and different icons for different types of logins to quickly differentiate between accounts. This software definitely allows you to be more secure in the workplace and personally. I'm able to have all of my passwords different and of great length. I have the database stored on a dropbox account so I can share the DB with the keepass app on my phone as well as my pc. Greater security is definitely being achieved with this application. "KEEPASS the virtual memory of keys"
"La mejor alternativa posible para gestionar tus contraseñas"
La verdad es que los gestores de contraseñas, entre los cuales se encuentra KeePass son programas muy basicos, solo alamacenan tus contraseñas o credenciales de ciertas aplicaciones o cuentas, por tal motivo no hay nada negativo que reseñar al respecto, dado que cumplen perfectamente con la funcion para la cual fueron desarrollados, lo mejor de todo esto al menos en el caso de KeePass es que este es totalmente gratuito y es soportado en diversas plataformas como Windows, Linux, MAC, Android, entre otras. Descarguenlo y prueben, total, es gratis. Me encanta la capacidad que tiene de admitir miles y miles de credenciales hasta en una misma base de datos. Añadir notas y actualizar las claves en distintos formatos es muy efectivo en organizaciones que a diario implementan un sistema de seguridad mucho mayor. Lo mas emocionante es que es completamente gratuita y de código abierto; así que se pueden realizar mejoras de forma manual si se sabe algo de programación. Tiene un soporte de idiomas impresionante. Alta capacidad de seguridad en cifrados para enviar contraseñas como para almacenarlas; evitando así cualquier método de hackeo de fuerza bruta. El aspecto físico es una de las características principales que no me gusta. Lo observo muy estático, muy simple para ser una aplicación tan productiva. Adicional, comento que no se sincroniza las contraseñas guardadas en la base de datos. Tenemos un grupo de trabajo en el cual usamos una misma base de datos para administrar las contraseñas. El punto es que al momento de actualizar una clave, automáticamente debería actualizar en los demás y no lo hace. Y por ultimo, cuando se actualiza este programa no se observan los cambios incluidos en la actualización. Espero que puedan mejorar la estética. Estos son los puntos principales que encuentro negativos. Sencillamente es muy practica; tanto en el nivel corporativo como a nivel personal funciona y se acopla muy bien. No hay necesidad de añadir mas. Es muy buena esta aplicación y con tan solo pocos clics se puede realizar la configuración necesaria. La utilidad y productividad que tienen este pequeño programa es enorme. Con él puedo enviar con tan solo un clic el usuario y contraseña de cualquier aplicación. En vista que trabajo como soporte técnico remoto, en muchas ocasiones se requiere enviar credenciales y son tantas que con esta herramienta podemos utilizarla al máximo. "Maximum security for your passwords with Keepass." It manages to have an important role for us and more when we handle a high amount of information, Keepass keeps us secure our accounts to access the applications, to portals, even I usually keep my payment card code in it. Since your security even to access your data is quite complete. It has a reasonable cost and that to date is not required something else because it correctly encrypts what you want to keep out of the public's eyes. Its mobile deployment has been something that must be improved, but maintains its essential role of keeping your credentials safe or all information susceptible, so as not to confuse each one, it allows you to place or distribute your directory tree to have your best organized access. The highlight of this tool is that without your password to access the credentials this does not show you even the content tree that has your Keepass Database, its function is very complete to keep intruders at a margin. Currently many of our colleagues and team work are using this application because we require you to keep the password safe, simply add the file that contains all the credentials and you can even export them in CSV or PDF. Something that not all can generate for you to have near you. It is difficult to review negative things about applications as useful and efficient as KeePass, that is, what could you say about negative if it is a tool that fully complies with the function for which it was designed? Rather, I am happy to have this tool, because as I mentioned before it allows me to store the passwords of my various accounts in a centralized manner and from there manage them, in addition to the security it gives me when using it. "Great tool to have your passwords"
Keepass is one of the best password organizers. It is very customizable and guarantees good security of your passwords with powerful encryption. In addition, the portability offered in a USB memory is useful. The management of passwords is also very useful and allows you to import them from multiple files. I like not to keep the information in the cloud, it's free and OpenSource. You can not ask for more from this great application. The graphical interface needs a refresh in its image. Also the synchronization with the equipment must be done manually, this can be complicated with large networks that have to manage dozens of computers. It does not have the function to save new passwords automatically. Consider that the centralized administration of passwords is an acceptable risk if you consider that a possible attacker will have all the keys of the network in one place. Therefore guarantee an excellent master key for your projects. Keepass allows you to organize your projects by giving a key to each of them and use this functionality to obtain better results. This great app significantly improved the management of keys in my day to day work. Since having a good master key and organizing each team, you can access the credentials quickly improving the productivity you have. This improves the service provided to customers.The learning curve of this software is long, you must take your time to learn all the functions. "KeePass is the ultimate keeper of secrets. " I love that their are multiple ways to log into your keypass and when the program starts the way you use is not preselected lol. Also the high level security passwords this program can generate is unreal. I love that it has a portable version so that you may only keep your passwords located on a flash drive. Just be sure to keep at least one backup stored in a safe place. Plus it not being an online password generator means it is less likely to use a password a automated password cracker would use. nothing really it is what it is and it does it in the most perfect way. Tired of wondering if you have a secure password? Tired of having to remember passwords? tired of trusting your browser to remember your passwords leaving them vulnerable to various phishing attacks and more? KeePass s amazing it is portable it is what you need to stay safe secure and protected. keeping all of my accounts safe and secure with high level protection that I have full control of storing offline. "Most secured password management I have tested"
- Plugins update is not always working great, especially browsers ones, that may need some manual copy-pasting of files to work. The setup may seem burdensome at first, but it is way more reassuring having its credentials in the company server than hosted by a third party, even if it is encrypted. A first step can be to use Dropbox integration first, to learn how to use it. I am saving my personal password as well as professionnal ones and can have an unique password everywhere, without having to remember it. This strenghten the security as a leak of one of website database will not impact on all my accounts, especially pro ones. The single problem we encounter is the password sharing between people, since Keepass does not offer any options, compared to Dashlane, which allow to share some passwords with other users, for example. "Guarda todas tus credenciales en una base de datos"
Agregas todo tipo de informacion confidencial: Usuarios, contrasenas, URL e informacion adicional. Puedes crear y duplicar entradas ya creadas con informacion. Creas una base de datos local o en red. Permite la sincronizacion de credenciales cuando el archivo esta abierto por varias personas. Una solucion bastante util para administrar tus claves. Unicamente ingresas con una sola clave. La interfaz grafica puede mejorar y colocar nuevos iconos. Administrar todas las claves de tu organizacion y acceder de forma rapida a toda la informacion. "Keepass: Tool for Organization and Quick Type"
Although its main intention is to be a safekeeping app for your passwords, it also serves as a tool that you can program/command to auto-type for you which makes it really efficient for logging in and also for jobs that require a lot of repetitive typing. The way that you can program it to do those auto-typing commands is a bit difficult especially if you have no clue about coding. In our department, someone had to basically do the codes for us and send it to everyone. Once you have the basic code though, you will find it easy to program it to the way that you want it to perform. Have a little background of coding before using it. Or have a basic tutorial so you can fully use its functions outside keeping passwords. For businesses that has a lot of tools (which therefore means a lot of passwords too), it makes it more secure for employees to just access this tool and not have a physical unsecured copy of the list of passwords that anyone can easily obtain. Another benefit of Keepass is how it makes typing and logging in to different applications really quick. Imagine programs that auto lock you out if you’re not active on it for like 15 minutes. That means having to type in your login info each time! That’s crazy! Not to mention, you’d have to memorize or go through your list of passwords each time. This open source application allows you to manage your internet credentials in a secure way. to improve your credentials administration, you can create groups where you can organize using topics, defining icons for this groups and making several customization such as: Expiration dates, auto typing function and plugins. Additionally, you can generate secure password and lookup for groups and credentials. The integration with browsers it's make by manual installations of a plugin by every browser. It 's a great option to considerate, if you are looking for a secure password manager app, easy to use and open source. My problem solved is simple. I don't have to remember every credentials. Every day, i have to use around 10 different internet credentials. But now, i can safe every credential set in KeePass and use it at the correct moment. "KeePass - My review "
Keepass is great software to create and keep safe all of your passwords. Combinations which it makes are really strong and to access all of them you only need to one password which you made before. It is very handy app which can make you more secured. I really don't like it's out of date design. It really looks like it's taken straight from 2009. Except that I cannot see any disadvantages. If you are concerned about the security of your data, you should consider using keepass. It helps my company stay more secure. Because of KeePass we only use strong passwords which aren't easy to decrypt. Also we don't need to remember them - app does, we just had one strong password we remember to access it. "KeePass, an excellent password manager"
The main reason I use KeePass is that it is available across all platforms that I use: Windows, Linux, and Android, and that I can access the same database for each platform. There are an number of websites that I go on that work better in one browser than another. I like the fact the KeePass allows you to choose between browsers. The Android implementation can be a little hit and miss in terms of allowing me to "jump off" to a particular set of credentials. KeePass, for me is the go to password management software. I had trialled LastPass before but did not like the idea of storing my credentials in the cloud. "Very helpful to manage multiple login credentials"
It's very easy to use, especially the auto type feature. Moreover it allows you to work in a more secure way, by choosing 30-character random passwords and saving them in keepass. This will make sure that it's impossible for others to either guess or remember your password. It's also easy to change passwords more often for security reasons because there is no need to remember them. There is not really something I dislike. Before using it for business ends, try using it for personal passwords first. This will allow you to experience how users will have to work with the software as well as how you work with Keepass as an admin. We have multiple people working within multiple software application, both our own as well as third party applications. Each users has it's own username and password that needs to change frequently. We create random 30-character passwords for everyone that change each month. Users don't have to remember or manage the passwords themselves. Everything is managed through keepass. "A good password database made great by its plugins"
Works well on both my PC and my Android device. Has two-forms authentication, fingerprint recognition (on phone) and built-in Dropbox and Google Drive support (via plugin). Some parts of the UI are a bit kludgy such as the password generator. I've yet to find dependable web browser integration. Other software and services exist, but this one is totally free and well supported. Having a well secured and centralized database of my passwords allows me to use more secure, random passwords everywhere. This increases the security of every password because I no longer feel the need to repeat the use of passwords across applications/sites, nor to utilize schemes to ensure that my passwords are easy for me to remember. "Indispensable password management for distributed small teams"
I work on a distributed team of around twenty folks and we rely heavily on KeePass to store credentials of all kinds. KeePass lets us store credentials for websites, databases, servers, licensing and notes to go along with it all. With the ability to sync with either a URL or a file, keeping everyone's entries synced up is a breeze. When a new person comes on to the team, it's easy to bring them up to speed on all our logins: install KeePass, load up the database file, and they are good to go. You can customize the keystrokes for copying the username and the password to the clipboard. You can store the database anywhere; shared drive, locally, SharePoint, etc. Not much to dislike really. Only complaint might be the interface, which can seem a little outdated, but hey, this is free software. Don't care for the password generator, I use xkpasswd.net for that. It's free software, so just give it a try. Take advantage of the ability to create folders and subfolder to organize credentials. We are sharing hundreds of sets of credentials over a distributed team of people. KeePass makes this simple. If someone is looking for a set of creds and you know it's in KeePass, the first thing you ask them is "When was the last time you sync'd KeePass? They usually haven't synced in a while, and all they need to do is sync and 3 minutes later they have what they need. Military grade encryption in an open source password manager that has native implementations on Windows, Linux, Android, iPhone, Apple, etc and integrates with Dropbox for always synchronized data. Takes a little setup to integrate it with Dropbox on Windows. This is the central repository for all the passwords and logins. The fingerprint integration on Android makes it a snap to open, and its own keyboard implementation allows me to just press "User" and "Password" to fill in fields in any Android app. A real timesaver that enables me to have unique and very secure random passwords on all the different apps without the penalty of wasting lots of time to enter the credentials. "A well protected key safe in times of overboarding login datas, passwords and the like." KeePass secures its Database with a Master Password and a key file. There is no way to access the Database without both. So it's best practice to save the key file somewhere else, than the database. An usb stick, which you always carry with you, for example. KeePass comes with an own password generator, which allows several options (like uppercase, digits, specials, etc.). This way, you can generate a bullet proof password. When entering your account details, just use ctrl+b to copy the login name and ctrl+c to copy the password. KeePass automatically clears the cache after several seconds. So you wont accidentally paste your password in the wrong place. Actually there is not much to dislike. KeyPass covers all my needs, while keeping itself clean and fast. Keep your keyfile somewhere else, than your database. KeePass functions as my hub to all those Login Datas someone accumulateds these days. For every Website, every Shop, even most of the software used, you need an own password. You can use some rules for the creation of your passwords, but as soon, as someone learns these rules, you got a problem. KeePass solves those problems completely. You just need to remember your MasterPassword and keep your keyfile save. This way, it's possible to use unique passwords for every account. "Best Product hands down for managing passwords"
Local desktop software that does not sit on the cloud. Ability to have the software create a password for you. Designed with a strong security mindset. Small, Can be installed on your computer or even on a thumb drive. There isn't that much I don't like. Some Confusion (for a newbie) around installation options and version. You have to read and think about it. Great, free software. Highly recommended. Face it. In IT we have to maintain numerous personal and adminstrator passwords. Too many to count. We need to keep those passwords strong. KeePass does the trick. The software sits on your personal computer, so it limits the attack vectors from hackers. "A very nifty password manager"
The feature that lets you double click a password, paste it, and then it is automatically removed from the clipboard after several seconds. Oh, and you can sort passwords into categories. Uhm... the interface? It looks archaic but you don't use it to admire its interface, do you? Just grab it, it does its job and doesn't try to be something else. Password management. The benefit when you can't remember your password is obvious but even when you do remember your password, it's still faster to grab it from KeePass. Plus password sharing this way seems more secure - the password database file can be stored locally. Some people might prefer using an online password keeper. I am not convinced that entrusting my passwords to someone else is a reasonable idea, but I make regular backups. I am not using the KeePass features to automatically type usernames and passwords into other windows. It's possible other products do this better. I can store my passwords securely on almost every device I use, and synchronize as needed. "Open source password manager software that is incredibly powerful"
KeePass allows you to carry it on a USB stick since it dosent require any installation which is quite useful. It also opens the door completely to all its source code, allowing you to install it on iOS, Android and adapt it to various platforms. If you are not tech-savy then you won't really like this application, there is no one easy click setup or installation wizard so you'll have to work on it. It's the perfect password manager software for someone who is tech-savy and likes to have total control and customization of their password system. Manage all your credentials in one central repository. "KeePass is a great tool to store passwords!" KeePass helps optimize my time by allowing me to just know the password to KeePass. I work for an IT company that implements HR software. I am staffed on multiple projects at the same time, so it's helpful to have KeePass such that I have a different password for each tenant, but I never have to remember the passwords. I also love the hot key functionality, which allows me to auto-fill my username and password. There isn't much I dislike about KeePass. One thing that is difficult is needing to work from a computer that does not have KeePass installed. KeePass allows me to create complex passwords, but this also means there are times, I don't remember the password. It would be great if there was a way to store these items in the cloud so I could access it anywhere. As I mentioned above, this product really saves me 10+ seconds every time I need to log into a different customer environment. "KeePass stores all my Passwords so I don't have to"
KeePass allows me to use different passwords for each and every account I have. The passwords can be extremely complex and all I have to remember is one password to access the database. I keep the database on a usb stick so I don't have to worry about passwords ever again. I can also keep a backup of the database in the cloud so if I forget the usb stick I can access my passwords without a problem. To use KeePass you have to have access to your database and a good mobile solution hasn't really been implemented yet. Every company needs a password policy and KeePass is a free solution that does the job without costing a fortune. KeePass allows us to keep track of passwords for all sorts of vendors with all sorts of varying security requirements. It also allows one administrator to have access to and make changes to passwords without worry about keeping the company up to date since they can easliy open and get updated passwords at any time.